Unfortunately due to the cold weather the pitches have frozen and training has been cancelled this evening. IES ladies were a force to be reckoned with this weekend, bringing home four fantastic performances which resulted in four wins. The day started at home with IES ladies 3s vs Felixstowe 4s. The ladies worked extremely well as a team and came away with a 16-0 win. The goals were from Annis Cousins (6), Issy Murison (2), Vicky Watts (1), Daisy Nunn (5) and Kay O’Reilly (2). This pushed the ladies into 1st place in the league and they are looking forward to next week’s match against Harwich 2s. Ladies 2’s travelled to Framlingham for an 11:15 game. After a great win last week, spirits were high. It took them the first 5/10 minutes to really settle into the game. They dominated the first half, with many shots on goal. Cathy Cook opened the score and then also got the 2nd goal from a great penalty flick. Maddie scored the 3rd goal before 1/2 time after some great quick passes. The 2nd half IES continued to maintain possession. Lots of short corner practice with Saph scoring the 4th goal from a straight strike off a short corner. Cathy then managed her 2nd week of scoring a hat trick getting the 5th goal. Finally Mollie completed the game with the 6th goal and also gaining Man of the Match vote. Great team work, effort and skills involved throughout the game. Ladies 4’s were home vs Christchurch 3’s at 11.30am. They took home their first win of the season Christchurch 1-0 which means they are now 6th place in the league table. All of the ladies worked incredibly hard throughout the match and a fantastic goal from a short corner by Rachel Harrison sealed the deal. The ladies 4’s go from strength to strength each week as they develop as a new team. Although there was great performances from each of the ladies on Saturday Arwen took home player of the match. Ladies 1s faced Harleston Magpies at 1pm. With the benefit of a home game, and some good results under our belt, the ladies were confident going into battle. Winning first push back, the girls began their attack straight away, and with a series of surges from the midfield, the girls had a number of opportunities, but Harleston GK was strong and denied the girls anything. After the first 15-20 minutes the girls began to tire, and Magpies took their opportunity to punish IES and opened the scoring. Maybe the wake-up call that IES needed the girls reacted quickly, a short corner was won and fired in by striker Georgia Harrold. This was then quickly followed by another short corner routine where Hannah Reed managed to find the back board. Scores at half time were IES 2 -Magpies 1. The second half IES seemed to have the majority of the possession Heather Dixon laying off some great balls to youngster Alex Tomlinson who had some fantastic runs up the sidelines. Stalwart Maria Wheelan was the next to score for IES from another short. IES feeling more confident continued to transfer the ball, which lead to another open play goal from skipper Abi Elsom. Harleston clever in their attacks saw IES weaknesses, and played on them. 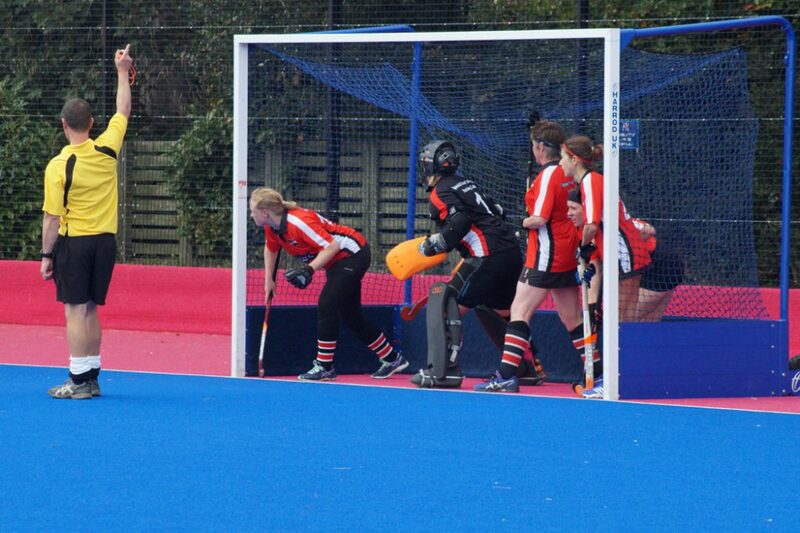 A number of times managing to hit the ball through IES press and threaten IES defence. However, despite IES giving the crowd another nail bitting finish they managed to keep Harleston from scoring (despite 2 short corners right at the end!) Taking it to the wire in true IES style the game finished 4-1. This was a very positive victory which keeps us top of the table ahead of next weeks opponents Dereham on goal difference. There were some very good individual performances which gives us optimism for our top of the table clash next week. IES Ladies 1s came away with a draw against Framlingham Ladies 1s this weekend. Here are some photos from the game. Ladies 1st team had an early start on Saturday with their first away game of the season to North Norfolk. Despite the long journey in their legs the girls started strongly, working the ball well with good distributions from the midfield to find the forwards early on. However, much the same as last week, the final balls continued to hit the pads and rebounds were slow to be followed up initially. Finally half-way through the first half IES finally broke down the experienced North Norfolk defence with a goal from debutant Heather Dixon who took it round the defenders and had a strong open stick strike at goal. This was shortly followed by a well worked short corner strike from Maria Wheelan, and a lovely open play goal by Amelia Preece. Despite IES looking and feeling in control of the game North Norfolk were quick on the attack, and with a slight lapse of attention North Norfolk found their way into the IES defending circle to put pressure on the defence and goalkeeper Sheri Bree. However, at half time the scores on the doors were North Norfolk 0- IES 3. Second half IES remained strong to begin with, and continued to work well as a team moving forward, however North Norfolk were relentless in staying positive and continued to challenge IES. Unsure of how the second half scoring went, but needless to say there were a lot of goals, it seemed very much one for one at one point where IES scored and North Norfolk answered with quick follow up goals. The pressure then showed with North Norfolk growing in strength and gaining confidence. IES for a period became very unsettled, and the game a little scrappy. Luckily a series of short corners won by some fantastic play through the midfield and pace by attacker Georgia Harrold, and also a penalty flick saw IES again add tally to their score sheet. In summary, despite the score it never really felt completely one-sided, as North Norfolk were always very quick to pick up on IES mistakes which naturally unsettled us as a team. Credit where it is due not at one point did North Norfolk give up. IES in the end were very pleased to hear the final whistle and to come home with a 7-3 win. Goalscorers were Heather Dixon, Maria Wheelan (2), Amelia Preece, and Abi Elsom (3). Man of the Match & Golden Stick went to Maria Wheelan for a determined and commanding role at centre back. Next Saturday’s game is vs newly promoted Framlingham at Rushmere at 11.30am. We look forward to seeing all our loyal home supporters back on the sidelines then! Following the summer break, a rigorous pre season and friendlies galore, the opening league weekend is upon us! With 3 league home games, including our Ladies 1s, there is plenty of hockey on show. We also have 2 home friendlies, so please come and show your support! Senior pre-season training has started! Join us as Ipswich School Sports Centre on Wednesday evenings – 7.30 til 9pm. £2 per session! IES ladies black played against a formidable Fram A this evening. The ladies battled hard but came away with a 3-0 loss. Kay O’Reilly was on fire as goalkeeper and kept the score from being much higher with some impressive saves and clearances. Despite some good movement up the pitch and lots of pressure, IES just couldn’t get the ball in the back of the net. IES black have their last summer league game next Thursday.